On the ice. Off the ice. It didn’t matter. Always it was Locker and Spehar. Or, if you preferred, Spehar and Locker. Indeed, state hockey fans were awestruck by the exploits of Locker and Spehar, who during their four seasons as varsity standouts put up the sort of scoring totals typically reserved for video games or pinball machines. They finished their careers with a combined 560 points, the highest total for two teammates in state history. Described by Randolph as a “200-foot player,” Locker was a do-it-all center who played responsibly in the defensive zone, where he helped initiate many of the Greyhounds’ scoring rushes. Although he was a gifted goal scorer in his own right, Locker excelled in the role of Robin to Spehar’s Batman, a sidekick to one of the greatest pure goal scorers the state has ever seen. Locker’s job, boiled down, was to get Spehar the puck. Spehar ranks fourth in the state in career goal scoring with 166. Locker’s 171 career assists rank third in state history. 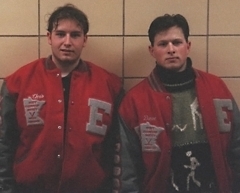 Locker scored a goal and added seven assists during the 1995 state tournament, the same year Spehar famously scored hat tricks in all three tournament games. Both were named to the all-tournament team. After the Greyhounds beat Moorhead 5-3 for the title, Locker was the first to receive the championship trophy, hoisting it in the air at center ice -- just as he had predicted he would a year earlier. “The funny thing is after we won the third place game (at the state tournament in 1994) I told Randolph that me and Dave are each going to have 100 points and I was going to hold the trophy at center ice,” Locker said. The next season, as a senior, Locker again took center stage. In a state semifinal against Apple Valley, he scored a highlight-reel goal late in the third period to push the game into overtime. The Eagles would eventually win 5-4 in five overtimes. The elapsed time was 93 minutes, 12 seconds, the longest (and many say greatest) game in state tournament history. 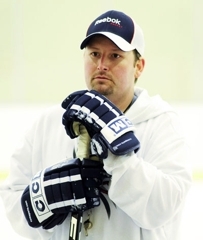 “To this day I’ll still have vivid dreams about that game,” said Locker, who now coaches youth hockey at the Bantam level in Duluth. “I was in the first stages of shock from dehydration, and they had almost pulled me from the game. In the fourth overtime I missed a couple of shifts. 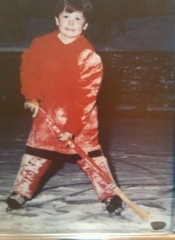 Later that same day Locker summoned enough energy to register six assists in Duluth East’s 9-2 rout of South St. Paul. “I don’t even know how we played that game, to be honest,” Locker said. After high school Locker bounced through various junior leagues in Canada and the U.S. before enrolling at the University of Minnesota. Injuries and poor grades derailed his Division I career, and he eventually transferred to UW-River Falls where, after not playing for two-plus seasons, he played one season to finish his career. Locker now works as a personal trainer through Locker19 Hockey Inc., his Duluth-based business. As for that uncanny connection with Spehar, all these years later it has hardly diminished. Locker still receives random text messages from his old buddy, and the two typically beef up their communications each spring during the state tournament.